I will come to your home a nd meet with you and your partner twice toward the end of your pregnancy (usually between 35-37 weeks). The visits usually last 1.5 - 2.5 hours each. I will do a thorough review of your pregnancy and health history, we will discuss your desires and wishes for your birth, and I will help you to understand your options in childbirth and clarify your birth preferences (sometimes called a "birth plan"). I will also help you determine exactly what questions to ask your care provider and hospital or birth center. We will discuss how we will all work together during your labor, coping strategies, and how to best take care of yourself during early labor. We will do a walk-through of your apartment and come up with ideas for how you may want to arrange your space for labor, optimal positions based on how your home is arranged, and so on. You can contact me as needed throughout your pregnancy. 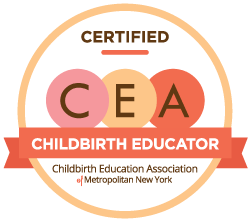 I can help you in resolving various pregnancy discomforts using herbs, massage and other natural methods, give you referrals for childbirth education and other classes, recommend books and other resources, help you navigate the often confusing world of maternity care in NYC, help you find right midwife or obstetrician for you and the birth setting that best suits your needs and desires, and discuss any concerns, fears or questions you may have. When you go into labor you can of course call anytime day or night. In early labor, before you need me there, I will stay in close phone contact with you and make suggestions for self-care and labor progress. Once you are in active labor and feel like you want my physical presence I will drop anything and cancel my other appointments to come be with you. This is the heart of birth doula care. I will remain with you throughout your labor and birth providing continuous physical, emotional, and informational suppor t. Find out more about how my presence is helpful during labor. This is one of the big benefits of working with a doula who is also a licensed massage therapist. Massage during labor is one of the most effective pain relief strategies that I offer. Here you can read more about how massage during labor is helpful. I will remain with you for the first 1-2 hours postpartum (occasionally longer if necessary), to help hold the space for your first hours of bonding with the baby and help you initiate breastfeeding. I will only leave once you and your family are settled and ready for quiet time together to rest. I will come to your home within the first week after you give birth to follow up with you. I will check in to see how breastfeeding is going and how you and the baby are adjusting. As a Certified Lactation Counselor I can support you in getting breastfeeding off to a good start (making sure you get a good latch and are comfortable using a variety of positions) . I can recommend herbs and other natural remedies to help you with any postpartum discomforts or problems. We will spend time discussing your feelings about the birth, and I can talk with you about adjusting to early parenthood and make referrals for support as needed. The first week is a time of many adjustments; you can call me anytime 24/7 within that first week with any questions or concerns regarding your wellness postpartum, breastfeeding, or baby care. I will offer support over the phone or refer you to the appropriate professional if the issue is outside of my scope. Even after that first week, I will always be available to you as a resource via occasional phone calls or emails. Please contact me for my current fees. Most health savings accounts or flex spending accounts will cover doula fees. You can add a "doula fund" to your baby shower registry (usually it doesn't take a lot to make up the difference between what you can pay and my fee). Occasionally health insurance companies will reimburse for some of the doula fee (and I am happy to provide you with receipts for your insurance company).